The Guard Garrison included many different units during the life of the POW Depot on Johnson’s Island in Sandusky Bay, Ohio. The first garrison consisted of four companies, A, B, C, and D, which made up the Hoffman Battalion. The battalion was named after Lt. Col. Wm. Hoffman, Union Commissary-General of Prisons. The battalion was at a strength of 718 men by September 16, 1862. On December 12, 1863, Company F was added. The remaining companies, E, G, H, I, and K, were mustered in during January 1864 at Camp Cleveland. These companies were mustered in as the 128th Regiment, OVI (Ohio Volunteer Infantry). On January 5, 1864, the first four companies were transferred to the 128th OVI. The total guard garrison was at a strength of approximately 1300 men by 1864. Many of the volunteers were from Sandusky and surrounding areas, as well as northwestern Ohio. Company C, 128th OVI in front of barracks building near main stockade Gate. From the Frohman Collection, Hayes Presidential Center. The guards were greatly disliked by the Confederate prisoners for several reasons. Rigid enforcement of the rules, sometimes ending in the wounding or death of POWs, probably was the number one reason. Second was that most of the guards had no prior military service in battle. Men volunteering for guard duty received a cash bonus and were exempted from field service. This meant that the guards would probably never serve on the battlefield. The Confederates deeply resented being bossed around by men who had never seen battle, had never been shot at, nor wounded in battle. The Hoffman Battalion and the 128th OVI were principally engaged in guarding Confederate prisoners. However, they did furnish detachments for service elsewhere against Confederates in such locations as western Virginia in 1862 and Southern Ohio against General Morgan’s raiders in 1863. 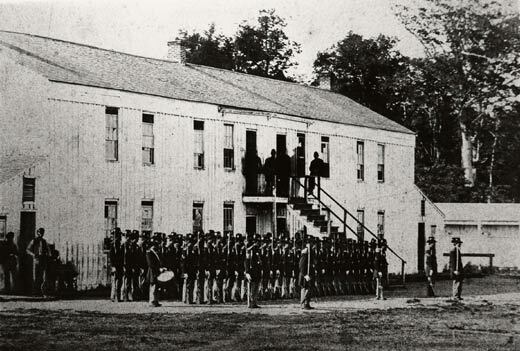 The Guard Garrison was reinforced from February to April of 1864 with regiments from the Army of the Potomac, 6th Corps, under the command of General Henry D. Terry and General Alexander Shaler. This was due to an aborted attempt by Confederates to purchase a steamer in Canada, arm it and raid Johnson’s Island, releasing the prisoners to join up with soldiers from other POW Camps and fight their way South. Of course, this never happened. The Canadian Government warned the U. S. Consulate that a raid was being planned. In January of 1864, a small detail of guards was posted as lookouts in the Clemons’ Stone House to look out over Lake Erie’s frozen waters for any Confederates attempting to march across the ice to Marblehead and then Johnson’s Island. On January 6, 1864, Special Order No. 5 was issued, ordering General Terry to Johnson’s Island with the First Brigade of his Division. Included in the move were the 122nd New York, 67th New York, 65th New York, 82nd Pennsylvania Volunteers and 23rd Pennsylvania Volunteers. The brigade was released to return to the battlefield in April of 1864. The 171st Ohio National Guard was assigned to Johnson’s Island for a brief period during the summer of 1864. On June 9th, the 171st was ordered to Covington, Kentucky to join in the battle with General Morgan’s raiders. After being captured and paroled by Morgan, the 171st returned to Johnson’s Island minus their muskets, cartridge boxes, and other government accoutrements. This loss of weapons and equipment did not go unnoticed by the Confederate prisoners. Later in 1864, the 193rd Pennsylvania regiment and the 6th U.S. Veteran Reserve Corps were assigned to Johnson’s Island for a short time to protect against possible raids from Canada. This was, in fact, a real threat as evidenced by the attempt of a band of 30 Confederates to release the prisoners on September 19th, 1864. Finally, in July 1865, the last guards were mustered out of service pursuant to orders from the War Department. The roster for Companies A, B, C, and D of the 128th Regiment OVI is given on the following pages. Viewing these pages requires the free Adobe® Acrobat® Reader® software. If you need to download the free viewing program, click here. For information about the other companies in the 128th Regiment OVI, contact jipres@johnsonsisland.org.